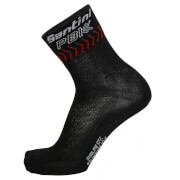 The Santini ‘Two’ medium profile socks are crafted with a breathable, lightweight construction that allows your feet to breathe and moisture to evaporate quickly. Breathable 3D dots enhance ventilation, while arch support gives targeted support in the foot. Complete with signature Santini branding woven into the design.